Only $12.99 for 12 full months. Take the plege for less than a one-month gym membership. Note: You will have the option to upgrade to Premium Membership after signing up for the free Core Membership. The Science: All facts are backed up with over 400 links to evidence-based research papers and articles. More Recipes: Many, many restaurant-quality recipes, plus soups, sides, bars, and desserts. Tips Everywhere: Inspirational quotes, did you know?, further readings and game-changing tips. Glossary: A list of important definitions such as hyperpalatablity, IIFYM, bliss point, and more. 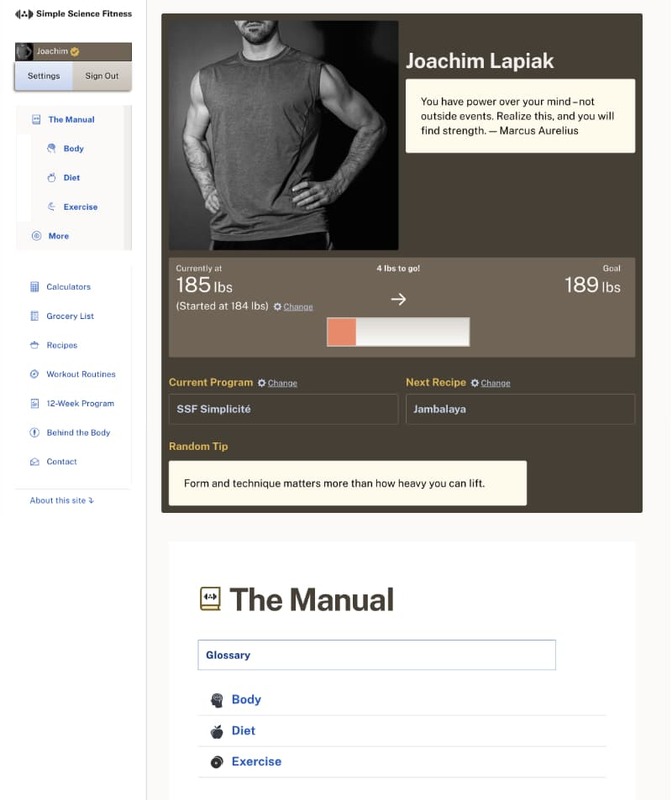 Bonus Calculators: Desired body weight calculator and strength standards calculator. Diets: Comparing the SSF Diet with the pros and cons of Paleo, Keto, Vegan, Mediterranean, and other diets, and why cleanses/detoxes are toxic. Answers: Answering "Will women get big and bulky from lifting?" (no!) and "Is it too late?" (no!) and many more questions. Bonus SSF Programs: 3x Berg (outdoor/playground), 3x Vanguard (bodyweight), and 4x Adonis (bodyweight). Hormones, gut microbiota, genetics, body weight, and body fat. The Law of Thermodynamics, cutting vs. bulking, and weight management. What affects our health and how to assess health. Obesity and body image, and how to regain perspective of ourselves. Explaining stress, injuries, soreness, and sickness. The importance of sleep and rest. The facts about metabolism and body composition. Simple anatomy and its functions. Macronutrients, all the good and bad, plus alcohol. Comprehensive list of foods in moderation, and foods to avoid. Addictions and strategies on how to break bad habits. Controlling hunger, satiety and appetite, and not letting it control you. The power and benefits of intermittent fasting. When to eat, plus cheat meals. Expanding on portion sizes and calorie counting. Nutrition timing and exercise, including for specialized athletes. Form and technique guidelines, including injury prevention. Finding out your maximum muscular potential. Motivation tips and why discipline is superior. Fitness-specific goals and sculpting your body to your desired physique. Links to the best advanced training programs, along with other beginner and intermediate programs.